We've been on this rollercoaster before - analysts and supply chain sources predicting that upcoming iPhones will face production delays due to the scarcity of this or that part, or due to the complex nature of putting it all together. Such predictions usually bomb by Thanksgiving, when, whatever production bottlenecks Apple might have had, get ironed out. This year, however, Apple may be attempting something it's never done before - a brand new and complex design of a third iPhone 8 that is said to be announced together with the iPhone 7s and 7s Plus. Thus, there might be indeed many pressing production problems, so Morgan Stanley’s Katy Huberty is the next in a long line of analysts who have by now predicted delays in launching the iPhone 8 at full speed. Last we heard, the problems with manufacturing yields for the new screen, camera, or Touch ID solution, weren't supposed to be fully resolved before November. In light of the most meaningful feature and technology upgrades in iPhone’s history - including OLED displays, wireless charging, and 3D sensors for AR - we believe it’s reasonable to assume the new, higher-priced OLED iPhone ships in October rather than September. 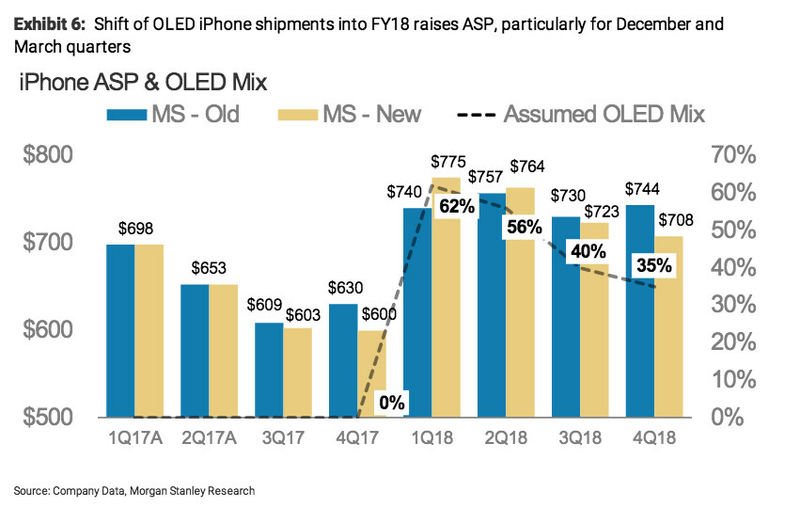 As you can see from the chart above, Morgan Stanley has altered their iPhone 8 sales predictions based on the supply bottleneck rumors, and have moved the bulk of its expected sales to H1 2018, with the respective huge increase in the average iPhone selling price for Apple. We can only imagine the quarterly profits Apple will be racking next year, if all of this goes to plan. Apple stock would definitely take a hit if the iPhone 8/x/10 gets delayed. Good time to short the stock. Seems like you want Apple to get hit with this hit. Purely a business decision. If i feel the stock will go down... why not short it? patience is success, GO APPLE!!! Maybe to you. The S8 is to me. Not sure what you meant there, but I found your reply no.10 epic. Oh......I got it now. Sorry it's just me at 5am! I thought you meant the iPhone was the best. My bad. nah, I think some people would buy both. Though it would be weird seeing people queue in long lines in March. It would be good for Apple since it could affect sales of S9/G7. However, I don't want to see Samsung pressurised again and release the S9 early. Hmm.. Not good. Planning to buy the iPhone 8 this year. I don't think I'm going to settle for the 7S if it still has the same design as the iPhone 6/6s/7 (huge bezel) unless they manage to incorporate the all screen design of iPhone 8 to the 7s. Analysts : iPhone 8 will be relesed in september Analysts : iPhone 8 will be relased in december Analysts : iPhone 8 will be released september 2018 Analysts : iPhone 8 is delayed, Apple is doomed Does any of them actually know when it's going to be released ? So Apple is the fault, not a bad analysis that the next iPhone is delayed compared to "analyzated" release date. It's as single-sided arrogance as it can get. This phone had better big big, and it had better be worth it, if all these delay rumors come to fruition. It's getting crazy with the rumor mill. Isn't the i8 just a big rumor anyway. I mean unless I missed something apple has never said them selves that there is for sure 3 phones this year, the i7s , i7s+ , and the i8. Last year's rumors said there would be 3 and there were only 2. This article sounds to me they are hinting there will not be 3 phone's. if this next iphone will not have 2k screen + proper to 2017` standards bazels this will be epic. Surely it was planned since more than a year ago. As the rumors started coming in early 2016, as far as I know. And from I believe, Apple never rushed an iPhone before due to the competition. Therefore I think it's release was already planned way ahead.